The goals Grand-Aides USA ® are to improve population health and provide appropriate access to care while reducing unnecessary emergency, clinic and hospital visits in adults and children, thus reducing costs: one person at a time. Grand-Aides USA provides an innovative health care delivery program with caring, experienced nurse extenders making home visits to develop a trusting relationship, connecting the patient and care team quickly and cost-effectively. 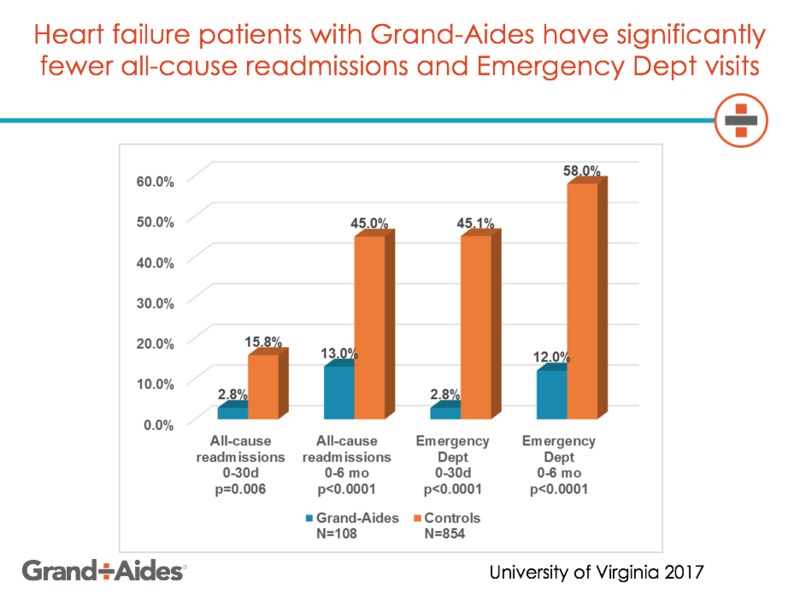 Grand-Aides: markedly reduce unnecessary readmissions, admissions, Emergency Department visits, length of stay and decrease cost significantly with extremely high medication adherence producing outstanding outcomes and patient satisfaction. Our results also permit hospitals to increase throughput admitting more patients and reducing waiting in the Emergency Department. We have the best published results in the world that we can find (we update the comparative results quarterly). From that article, GA patients had 2.8% 30-day all-cause readmissions vs 15.8% in the controls -- an 82% reduction (aOR=0.17; p=0.0060); 6-month all-cause readmissions 13.0% vs 44.7% (aOR=0.19; p<0.0001); Emergency Department 30-days of 2.8% vs 45.1% (aOR=0.03; p<0.0001); ED 6-months 12.0% vs 51.5% (aOR=0.09; p<0.0001); GA mortality within 6 months was 2.8% vs 7.7% (aOR=0.37; p=0.1141). Net savings per GA was $562,097, a 7X return on investment. This represents the best data in 5 years when compared with other published programs to decrease readmissions. 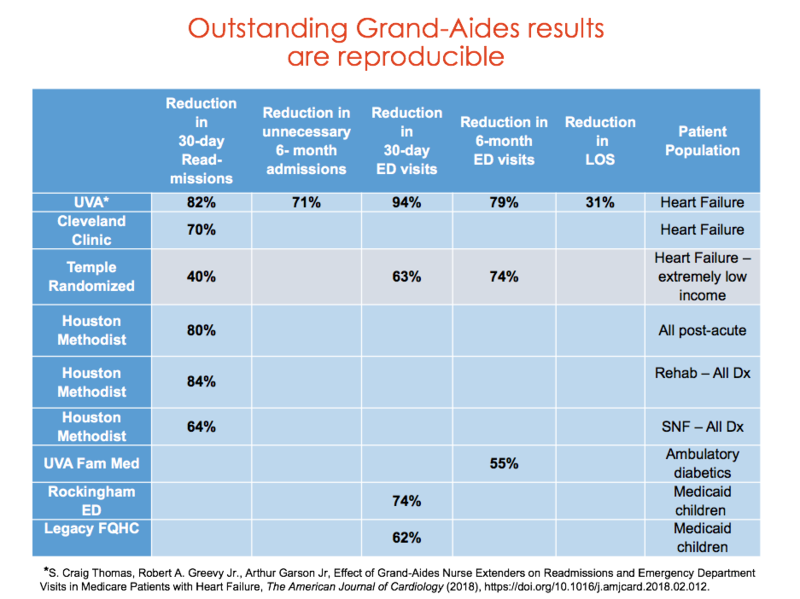 Grand-Aides are extremely effective in a number if settings from the "higher end" to clinics with homeless people (Temple). The Temple data were randomized against an already-existing community health worker program designed to prevent readmissions in heart failure -- and still had a 40% decrease in readmissions and 63% reduction in ED visits at 30 days -- compared to the community health worker program. In Medicaid "dual-eligibles" and children, the University of Texas School of Public Health recently published that among other approaches, Grand-Aides were superior in reducing readmissions, ED visits and improving medication adherence, potentially saving 6% of all Medicaid expense. Grand-Aides are certified nurse aides who make frequent home visits to people with chronic disease to keep them at home and out of the hospital and emergency room. They "act like a good grandparent" (hence the name "Grand-Aides") and almost become a member of the family. The aides are usually in their 40's to 50's -- and "illegal" to require someone to be a grandparent as it "discriminates against those without grandchildren" -- we did find that out at the White House. Each home visit is about 45-minutes and supervised by a nurse on video for 5-10 minutes; that nurse then communicates with the patient's physician every day with electronic records as well as emails / calls. We have found that patients and families confide in the aides and highly respect the nurses and physicians so it is a magical formula to have both aides and professionals. The major tasks are to get all the medicines right and to get danger signs of disease relapse well understood by the patient and family. The first week after going home from the hospital the Grand-Aides visit 3 times. Then depending upon the patient we decrease the number of visits over the first month to once per week and for most, we switch to the Grand-Aide making "telemedicine" visits (again nurse supervised) over the next several months but with the ability to make a home visit, and put the patient on video within hours of a concerning call. Grand-Aides USA works with 3 national employment agencies to employ local Grand-Aides, nurse supervisors and social workers who then interact with the program's or health system's nurses and patient's physicians. An early reaction is, "We can do this ourselves." The most poignant response was by a Chief Medical Officer who called on a Sunday and said, "UNCLE!" When I asked what that meant, he said he had worked successive weekends to re-create our manuals and was, "Throwing in the towel." It works. Among the best (if not THE best) published results for management of chronically ill patients. Care Transitions/Chronic Disease Care aimed at improvement in health, management of chronic disease, and reduction in resource utilization (e.g. hospital readmissions) for such conditions in adults as cardiac disease (heart failure , acute myocardial infarction, post coronary bypass and post percutaneous coronary intervention), Diabetes and others as well as reducing Emergency Department Hyper-utilizers in adults and children. Primary care. Grand-Aides function as a part of a primary care team, e.g. a "Patient Centered Medical Home" to help care for adults and children. Grand-Aides first meet the patient / family in the clinic. When a member of one of these families calls, the Grand-Aide asks a series of questions in a "protocol" (or questionnaire) for one or more of 20 conditions (e.g. cold, fever). The Grand-Aide receives instructions from the supervisor, and may involve a home visit by the Grand-Aide. They also make home visits for primary prevention – and efficiency (e.g. reduce "no-shows") as well as secondary prevention – and “intervention” with intense attention to medication adherence (e.g. for asymptomatic patients with hypertension). In the article in Health Affairs on primary care: 62% of drop-in acute care clinic visits could have been potentially cared for by a Grand-Aide and Nurse Supervisor and 74% of Emergency Department visits fit one of the 20+ Grand-Aides protocols. Population-based programs. Each Grand-Aide may be trained to do more than one of these programs and approach entire populations rather than by disease. There are also programs for entire populations such as Medicare, Medicaid, and ACO’s. We also have programs aimed at sub-populations such as the frail elderly with chronic disease, as well as secondary prevention to improve adherence with the medical regimen and diet in hypertension, diabetes and obesity. Rural Care Delivery. Grand-Aides meet patients in the hospital or clinic and ideally make at least one or two home visits, regardless of the distance to see the home environment, meet families and understand the home conditions. The Grand-Aide then makes sure the patient has a method to do video and understands the use – either dedicated television camera, tablet or smart phone. If the family does not have this, it will be an expense to the program. If it is absolutely not practical to make even an initial home visit, then the “bonding” of the patient and family with the Grand-Aide must occur entirely in the clinic or hospital. Grand-Aides USA programs Grand-Aides USA has programs in various settings: Integrated systems, Academic health centers, ACO's, Hospital systems, Mental health hospitals, Medicaid HMO's, Community hospitals, Physician groups, Home health agencies, Visiting Nurse Associations, Indian Health Service, Rural Health, Medicare Advantage, Commercial Insurers, FQHC's, Medicaid, Professional societies. Gold Award for Empowerment of Women category in 10th Annual Global CSR Award and Summit 2018.